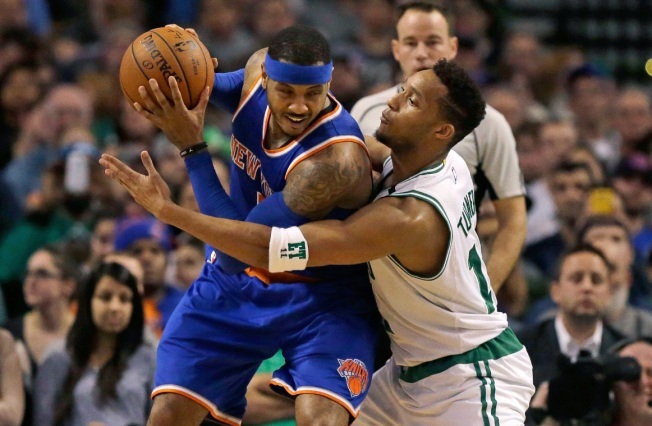 Isaiah Thomas had a pair of key baskets and finished with 21 points, Evan Turner scored 19 and the Boston Celtics won their fourth straight with a 100-91 victory over the New York Knicks on Sunday night. Jae Crowder scored 18 points and Kelly Olynyk added 11 points and nine rebounds for Boston. Thomas added eight rebounds and six assists. Carmelo Anthony led the Knicks with 29 points despite shooting just 11 of 26. Kristaps Porzingis had 16 points and 12 rebounds. New York, which shot just 37.1 percent, lost its fourth straight.